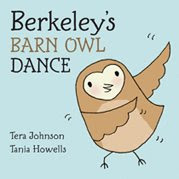 I recently received a copy of Berkeley's Barn Owl Dance (published by Kids Can Press) that is due out in October this year. As it is with a great many children's books, they frequently hold messages for the adult reader as well. This book is no exception. I liked this book immediately (simply) because it is Tera Johnson's first work. It must be so exciting to have your first book published! Knowing that information sparked my interest in it and caused me to want to pick it up and see what she created. What Johnson created was a story about three young barn owls leaving their parent's home and making their way into the big, wide world. It's a story of exploration and discovery, simply put. What I read out of it was that Berkely took away from her parent's home traditions and talents that were shared by her immediately family and then she welcomed new friends to share the same joys with her in her new home. The message of the book is to "bloom where you are planted". Berkeley ends up doing just that. A cute aspect of this book is the "Flappity, tappity, clap, clap, clap!" that resonated throughout the story. It just keeps the book going in a fun and delightful manner that will help hold the attention of younger readers. Due to the amount of words per page, I would peg this book for ages 4-8 or thereabouts. The illustrations by Tania Howells are simplistic and charming. This is a great first effort on the part of Tera Johnson and it will be curious to see what other stories come from her imagination in the future. Sounds cute! How'd you get an advanced copy?